As the old Zen koan advises, row row row your boat, gently down the stream, merrily merrily merrily... summer is but a dream. Dear (beautiful and appreciated) reader, forgive my clumsy extra syllable as I squeeze summer in for life and stumble up the rhythm for the sake of my wandering focus today, which is how mind-bogglingly fast time goes by. In spite of the airless, oven-style heat. In spite of the sticky sleepless nights (thank goddess for iPhones). Summer is careening into Fall faster than you can say Lady GaGa is gluten-free. And zucchini is taking over the universe. But I've got your back. Because life is all about flow, baby. 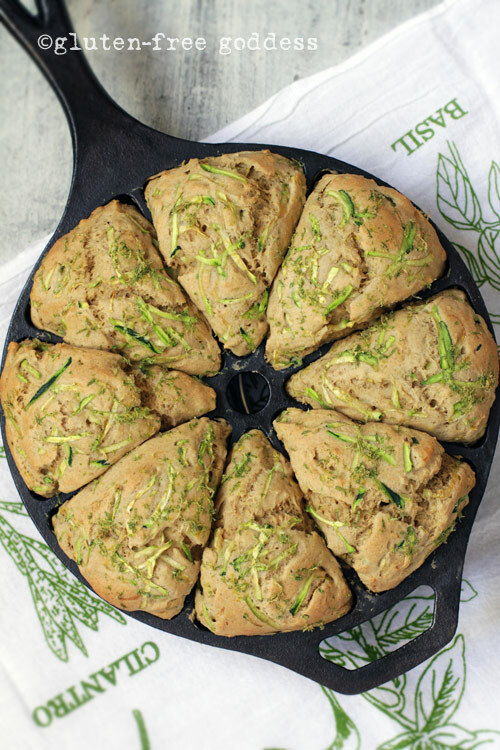 Tender and laced with lime, these light and golden zucchini scones are a refreshing change from your average gluten-free scone. If you don't have a scone pan, you can bake the scones as a round loaf in a cake pan, and cut the round into eight wedges. Preheat the oven to 350º. 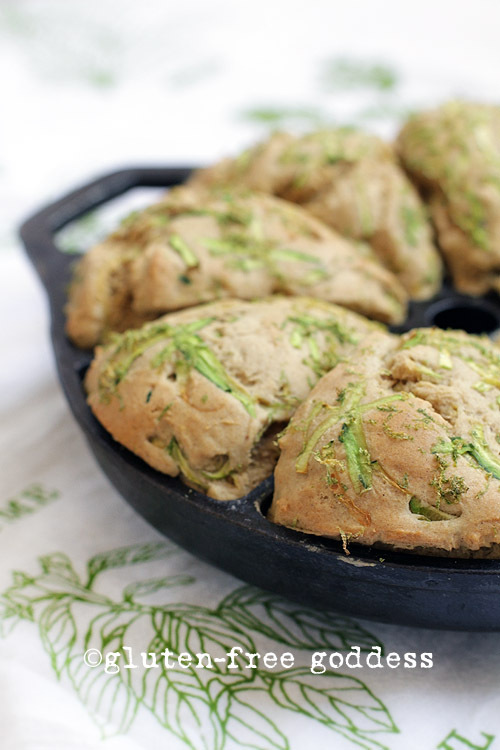 Lightly rub the scone pan with a touch of coconut oil. In a large mixing bowl, whisk together the flours, starches and dry ingredients. Add the coconut oil and beat to distribute, until the mixture looks sandy. Add the eggs and rice milk, lime juice and coconut extract. Beat until smooth and sticky. Add in the half cup of shredded zucchini and the lime zest. Stir in by hand. Spoon the dough evenly into the scone pan. Using wet fingers, smooth out the tops. 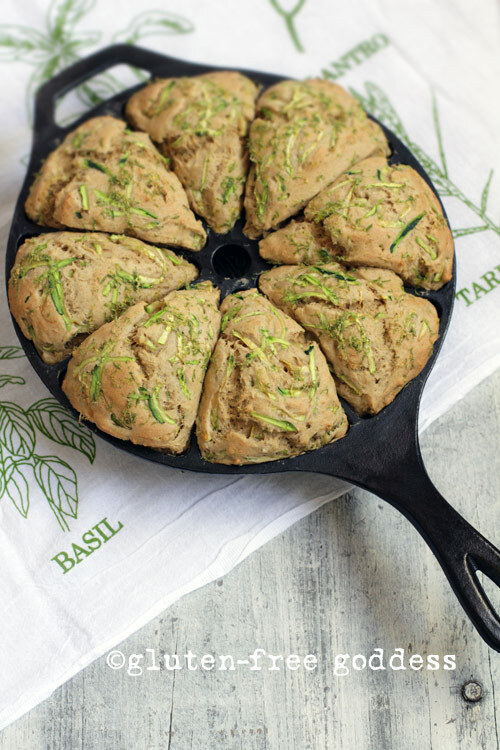 Add a few strands of shredded zucchini and some lime zest to the top of each scone. bake in the center of the oven for 25 to 35 minutes, until the scones are golden and firm to the touch. Wonderful with vegan butter. Freeze wrapped scones for future treats. Thaw and warm for serving. We grill ours in a pat of vegan butter. Note: For how I baked scones without a scone pan, see my recipe for Pumpkin Scones with Maple Icing.